Friday, September 01, 2017 by Isabelle Z. In the aftermath of a nuclear attack, there are a lot of things you’ll want to do, not the least of which is taking shelter immediately. When it’s safe to do so, however, you’ll probably want to take a good, long shower and scrub away all that nuclear dust if you were outside during the blast or afterward. Just be sure that you resist the urge to use conditioner in your hair or you could find yourself making the situation even worse. In an interesting warning by the U.S. Office for Civil Defense to those living in Guam following nuclear strike threats from North Korea, people are being advised to avoid conditioner because it can “bind radioactive material to your hair.” This, in turn, makes it very difficult to remove the toxic particles. The idea of worrying about the condition of your hair after this type of disaster might seem laughable, but you will want to do everything possible to the minimize damage as far as nuclear radiation is concerned. Shampoo and soap are fine and even recommended. Conditioner, on the other hand, contains compounds such as cationic polymers and silicone that pull down the scales in hair to make the hair look smoother. Hair is made up of proteins in the formation of overlapping scales, and radiation safety expert Andrew Karam says that particles of radiation contamination can get in between those scales because our hair essentially comes apart during the day somewhat like a pine cone. On top of that, conditioner leaves oily compounds behind in the hair, and nuclear particles can easily stick to them. The same is true of moisturizers and cosmetic products that come in a stick format. The first thing people should do after surviving a nuclear attack is take off the outer layer of their clothing, which can remove as much as 90 percent of radioactive material. Place the contaminated clothing inside a plastic bag and then seal it and store it away from other people and animals. It is also important to gently blow your nose and wipe off your eyelashes and eyelids using a clean cloth. When taking a shower, use shampoo and soap to get radioactive dust off of you, taking care not to scratch or scrub your skin. If a shower is not available, wet wipes should be used to clean any parts of the skin that were not covered by clothing. Taking shelter is also vital as winds can carry radioactive waste for hundreds of miles. The warning came after North Korea said it would test a missile and create an “enveloping fire” that would surround the U.S. territory, but the North Korean state media announced a few days later that the test would not ultimately be carried out. Nevertheless, it’s a good idea to know what to do should such a situation occur. 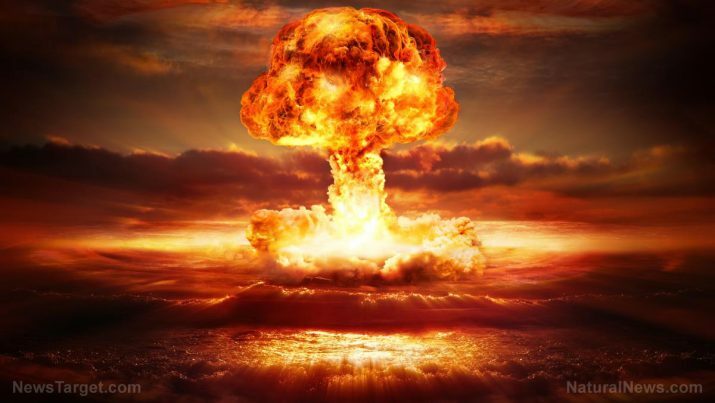 Nuclear blasts are explosions that bear an intense amount of heat and light, along with a harmful wave of pressure, spreading radioactive material through the water, air and ground for miles. According to Ready.gov, military bases, government centers, strategic missile sites, financial and technology centers, chemical plants, ports and major transportation hubs are all potential targets. To protect yourself from radiation and nuclear fallout, there are three essential factors: distance, shielding and time. You’ll want to head underground if possible and shield yourself from fallout particles with thick walls, bricks, or dirt. As time passes, it will be okay to leave the fallout shelter, with the biggest threat occurring immediately after the blast. This is why it is vital to have a good plan in place to improve your chances of surviving such a situation.